Spruce up your aging wooden pool deck with our spotlight product of the month “Deck-A-New”! Some people believe that their aging wooden decks need to be demolished and replaced, which can be extremely costly and time consuming; in reality almost all wooden decks need is a couple layers of a coating to make it look new again. Deck-A-New is specifically designed for revitalizing interior and exterior wood. With 100% acrylic durability “Deck-A-New” is water resistant and locks down splinters by filling cracks up to ¼” making the surface barefoot friendly after just two coats. Hand stir the Wet-Look Sealer for a glossy and super clear finish. 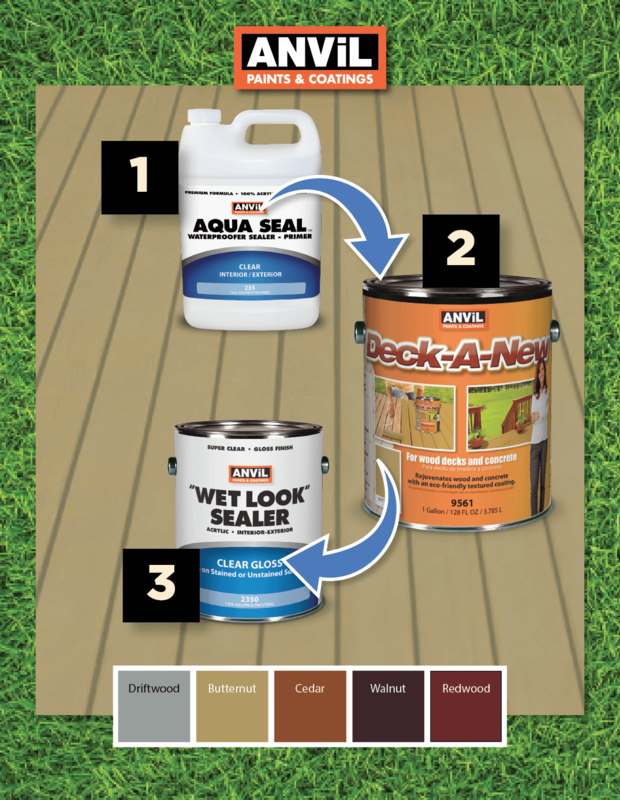 Wait four hours to apply a second layer of the sealer and once the last layer has dried, your deck is ready for use!